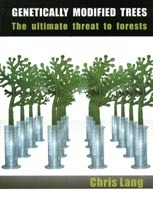 The UN has included GE trees as a possible means of combatting climate change. It won’t work. By Chris Lang. Published in Gen-ethischer Informationsdienst, February/March 2005. When the thousands of participants get together each year to discuss climate change at the Conference of the Parties to the UNFCCC, reducing greenhouse gas emissions is not even on the agenda. In December 2004, the tenth Conference of the Parties (COP-10) took place in Buenos Aires. After two weeks of negotiations, the best that the more than 6,000 participants could achieve was an agreement to hold another meeting. But at this next meeting, which is to be held in Germany in May, participants will not be allowed to discuss anything which might lead to new commitments. The US refused to agree to a meeting focussing on compulsory reduction of emissions. Kyoto’s “market orientation” allows Northern countries to meet part of their emissions targets by trading carbon dioxide with each other. Carbon trading “turns the earth’s carbon-cycling capacity into property to be bought or sold in a global market,” states the Durban Declaration on Carbon Trading, which has been signed by more than 100 NGOs. Kyoto’s “market orientation” also allows increased emissions of greenhouse gases. Through the Kyoto Protocol’s clean development mechanism, industrialised countries can invest in projects in the South which are supposed to store carbon, thereby gaining credits allowing further emissions. One example of this is the establishment of tree plantations as carbon sinks. On one level, it all sounds perfectly reasonable. Trees absorb carbon dioxide from the air through photosynthesis. Carbon is stored in wood and other tissues until the tree dies. But the logic behind carbon sinks is based on a fraud. In the international climate change negotiations, one ton of carbon released by burning fossil fuels is considered to be the same as one ton of carbon contained in a tree plantation. From the point of view of the impact on the climate, however, these are two different types of carbon which cannot be added to, or subtracted from, each other. When carbon is stored in the form of fossil fuel under the earth it is stable. Unless it is dug out and burnt, it will not enter the atmosphere. Tree plantations are relatively unstable. They can catch fire, they can be destroyed by pests, they can be damaged or blown down in storms, they might be logged or local communities might try to reclaim the land they lost to the plantations by cutting down the trees. All trees eventually die and decay. In all these cases the carbon temporarily stored in the trees is released to the atmosphere. In December 2003, at the ninth Conference of Parties to the UNFCCC (COP-9), government representatives agreed the rules under the Kyoto Protocol’s clean development mechanism for tree plantations as carbon sinks. One of the decisions reached at the meeting allows genetically engineered (GE) trees to be used as carbon sinks under the Kyoto’s clean development mechanism. Before COP-9 both Norway and Switzerland had publicly argued against the use of GM trees in the Kyoto Protocol. At the meeting, the Norwegian negotiator suggested excluding GM trees entirely from Kyoto. 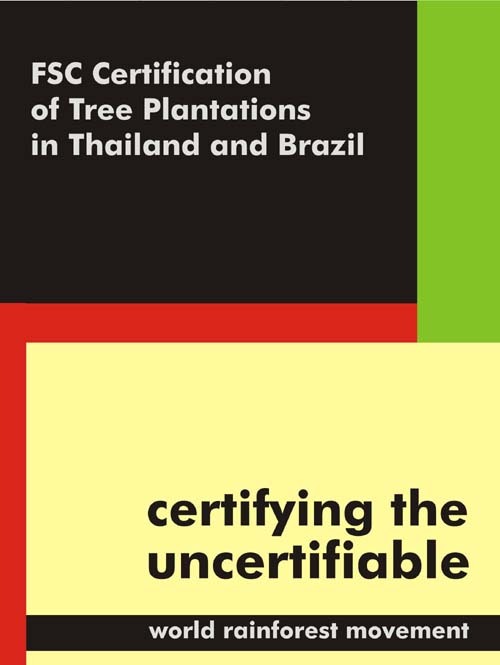 Nevertheless, the end result of the COP-9 meeting was that Kyoto rules now state that countries where plantations of GM trees as carbon sinks are planned should “evaluate, in accordance with their national laws, potential risks associated with the use of genetically modified organisms by afforestation and reforestation project activities”. Even the mention of the word “risks” was too much for Harlan Watson, the US chief climate negotiator. “We felt particularly that this singling out of GMOs was inappropriate in this context,” Watson told Agence France-Presse. In order to have a noticeable effect on the climate, immense areas would have to be planted with trees. Industrial tree plantations have caused serious problems for communities living near them in the South. In Brazil, for example, Aracruz Cellulose, the world’s largest producer of bleached eucalyptus pulp, established its plantations on the lands of the Tupinikim and Guarani indigenous peoples and other local communities. 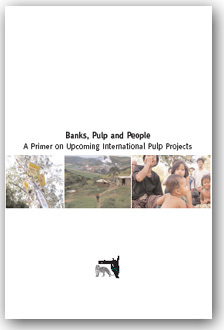 In April 2004, Brazil’s Movement of Landless Peasants protested against the pulp and paper industry’s take over of vast tracts of land in Brazil. 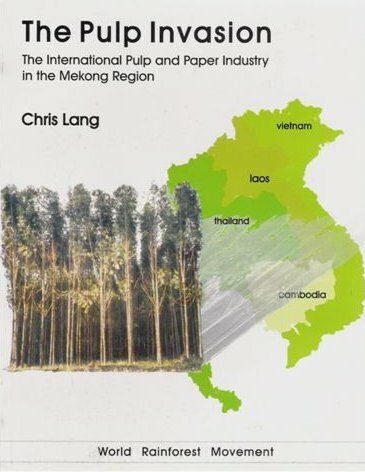 Landless people occupied areas of industrial tree plantations owned by six pulp and paper companies including Aracruz. Using GM trees as carbon sinks would bring problems additional to those of large scale industrial tree plantations. In 1993, Japanese car manufacturer Toyota started field trials to test trees which had been genetically modified to absorb more carbon. While carbon absorption increased, Toyota’s scientists also noted a dramatic increase in water consumption. Two years ago, the Chinese government allowed the commercial release of GM trees. Well over one million insect resistant GM poplar trees have now been planted in China. Many of China’s GM trees are planted in experimental plots, but it is possible to buy GM trees from Chinese tree nurseries and to plant them anywhere in the country. Neither the Chinese government nor the forestry scientists who produced the trees have records of where the trees have been planted. Huoran Wang, a forestry scientist at the Chinese Academy of Forestry in Beijing, explained the risks involved at a meeting organised by the UN Food and Agriculture Organisation in 2003. “Poplar trees are so widely planted in northern China that pollen and seed dispersal can not be prevented,” Wang explained. He added that maintaining “isolation distances” between GM and non-GM poplars is “almost impossible”. Forestry scientists are working on producing GM trees which are sterile, in order to prevent the trees from crossing with natural trees. Plantations of sterile trees would have neither flowers nor would they produce fruit or seeds. They would grow faster but would be silent. Silent, sterile monocultures might look good from the corporate perspective, but they would be a disaster for insects, birds and wildlife as well as for people living near the plantations. The US Department of Energy is funding a three year, US$5.1 million research project into the possibility of using plantations of poplar trees to store carbon. Scientists at Oak Ridge National Laboratory (ORNL) are collaborating with the Universities of Florida, Oregon State and Minnesota as well as the National Renewable Energy Laboratory and the US Forest Service to produce GM trees which would store carbon. “We’re talking about millions of acres,” ORNL’s Stan Wullschleger told the Knoxville News Sentinel in March 2003. 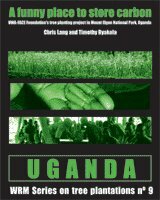 The decision reached in December 2003 at COP-9 allowing Northern companies and governments to establish plantations of GM trees in the South might be precisely the subsidy that proponents of GM trees have been looking for to impose their dangerous new technology on the world. The winners would be timber plantation companies, consulting firms and polluting energy companies. The losers would be rural people in the South, who would see their lands converted to monoculture tree plantations and their livelihoods destroyed. If they are ever planted, the resistance to GM tree carbon plantations will be massive. 1. A list of companies that support World Resources Institute appears on the organisation’s web-site. Here is a short selection: Shell International, Shell Foundation, Monsanto, McDonald’s Corporation, Microsoft Corporation, BP, Citigroup Foundation, Cargill Dow, General Motors Corporation, Ford Motor Company Fund. 2. 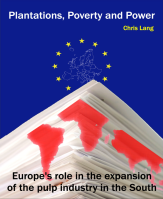 Michael Zammit Cutajar “Reflections on the Kyoto Protocol – looking back to see ahead”, 1. Juli 2004, in Memorandum to the Inquiry into the International Challenge of Climate Change: UK Leadership in the G8 and EU, The Corner House, Sinks Watch and Carbon Trade Watch, December 2004. 3. Larry Lohmann, Race to the Bottom at the Climate Talks, Forest Cover: A Global Forest Coalition Newsletter on International Forest Policy, Nr. 11, Februar 2004.